See how an easy way to test your WordPress plugins for PHP 7 compatibility in this quick MaAnna Minute video and tutorial. This post is part of the Seriously Old Plugin Challenge. Like reading better? See the written tutorial with screenshots below the video. NOTE: If the checker hangs on a plugin, you can deactivate that plugin and run the check again on only active plugins. Check with your host about how to update your account to PHP 7. Read: How to Migrate to a New Host if your host needs to move you to a new server with PHP7. Subscribe to the BlogAid YouTube Channel and never miss one. 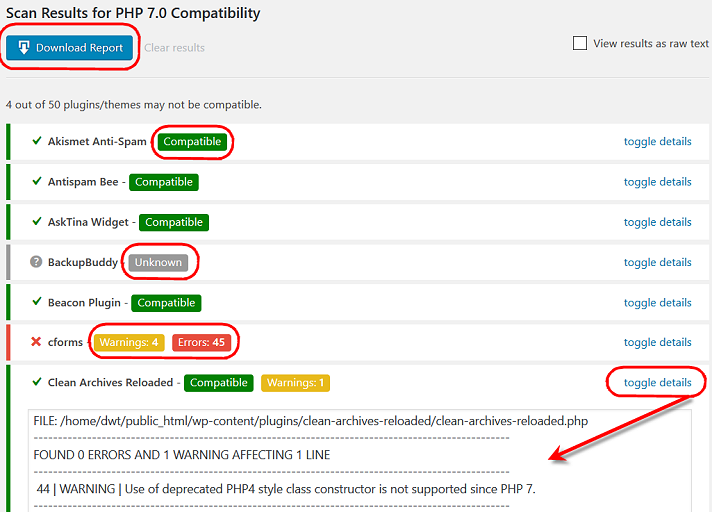 First, install the PHP Compatibility Checker plugin from WP Engine. You should be able to easily find in the WordPress Plugins repository. It does require the default WP virtual cron to run. So, if you’ve hard coded that off and set up a cron through your hosting cPanel, you’ll want to turn on the virtual cron for this test. For most of you, that won’t be the case. Next, select the scan settings. 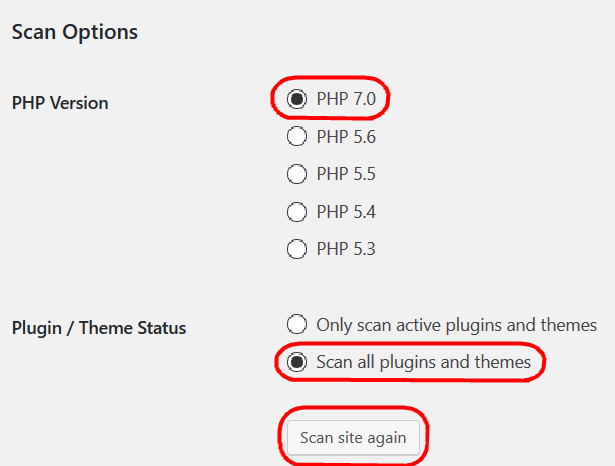 Select the PHP 7.0 option, if it is not already set to that. Select Scan all plugins and themes. Then click the Scan site button. While it’s scanning, you’ll want to read through the Limitations and Caveats section. You’ll see that this plugin is not 100 accurate, nor does it test everything. And you’ll see a link for a whitelist of plugins that can produce false positives. But, I’ve found that these tests give a pretty full list of the super old plugins that you likely want to get off your site anyway. And, it gives you a clue what plugins are not yet PHP7 ready before you make that switch, which is very handy. I have this running on a clone of a client’s site that has 50 plugins, several of which have not been actively developed in years and pose a serious security risk. Many others are actively supported, but may not be PHP ready. And then others are premium plugins and there is no data in the WordPress repository on them. So you’ll want to check with the developer directly for those. Now, this plugin is only slightly heavy on your site, but I wouldn’t run it at high traffic times. Once the scan is complete, you’ll see a graphic of the plugin report with the status of each plugin’s compatibility. Note that some are green and say compatible. Some are gray and Unknown. Those will likely be premium plugins not in the repo. Some have yellow warnings. Those will likely work, but may have a glitch. And some report red errors. Those will likely be the super old plugins that are no longer actively supported. Even if you don’t switch up to PHP 7 right away, you’ll want to find a substitute for those really old plugins because they most likely have outdated code and pose a security risk to your site. For others that are red with errors, or have lots of yellow warnings, but are actively supported, you’ll want to research them to see if those are false positives and if the plugin has been tested with PHP 7. Most all plugins in the WordPress repository have a support forum and that’s probably the best place to ask. There’s also a blue button at the top to Download the full report. It has tons of extra info about each plugin and lists the warnings and errors in more detail. You can also click the Toggle Details link on any plugin to see that extra info too. If you find that too many plugins are not PHP 7 ready, check with your host to see which PHP version you’re currently on. If it’s below PHP 5.6, run a scan for that, as it is the currently supported and stable version and you want to be on at least it. All others are no longer supported and that’s both a performance and security risk for your site. Except for any super old plugins that you’re going to want to get off your site anyway, most all currently supported plugins and themes should be compatible with PHP 5.6. I hope you’ve enjoyed this quick tutorial on how to easily check your plugins for PHP 7 compatibility. Be sure to subscribe to the BlogAid YouTube channel for more tips. Any suggestions. I’d like to have my host update my PHP but I had a plugin ruin my site and so I had to revert it back to the old a couple of months ago. I’m not sure what actually broke my site and so I’d love to use this plug-in before I ask my host to change my PHP. Valerie, if you’ve never had anyone turn off the WP virtual cron for you and add a script via cPanel for a new cron, then don’t worry about that part. For the PHP7 compatibility plugin checker, if it is throwing a fatal error, then there may be some other issue or restriction on your site that is causing it. You’ll want to check the plugin’s forum to see if anyone else has encountered this. If not, you may want to report it. 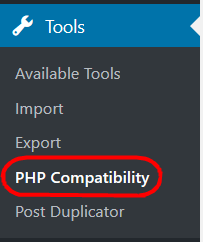 Some hosts also have their own way of checking for PHP compatibility, so you may want to contact them to see if they can help with that before you switch again. Other than the above, it may take a developer to look through your site and find the issues. There are just too many variables for me to guess sight unseen. And, a developer could dig deeper into the code than I can.